A police officer fatally shot a man in The Bronx on Sunday night after he charged at cops twice with a stick and a knife — once after being tased, according to law enforcement sources. 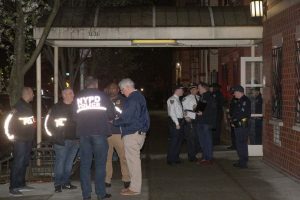 Authorities had gotten a call around 10:45 p.m. about someone harassing residents at the Hill House halfway house in Morris Heights when they came into contact with the individual, sources said. The suspect was allegedly banging on doors inside of the building before cops arrived. Sources said two officers, including the one that shot him, knocked on his door and were immediately attacked by the man. They tasered him, and he stopped for a brief moment, but charged again when the cops went to handcuff him, the sources said, noting how this was what prompted the shooting. The man was transported to Bronx Lebanon Hospital in critical condition, where he later died. Hill House, which is run by Palladia — a nonprofit social services group — provides transitional and permanent housing for people suffering from addiction, homelessness, poverty, trauma and domestic problems. Officials could not be reached for comment after the shooting.